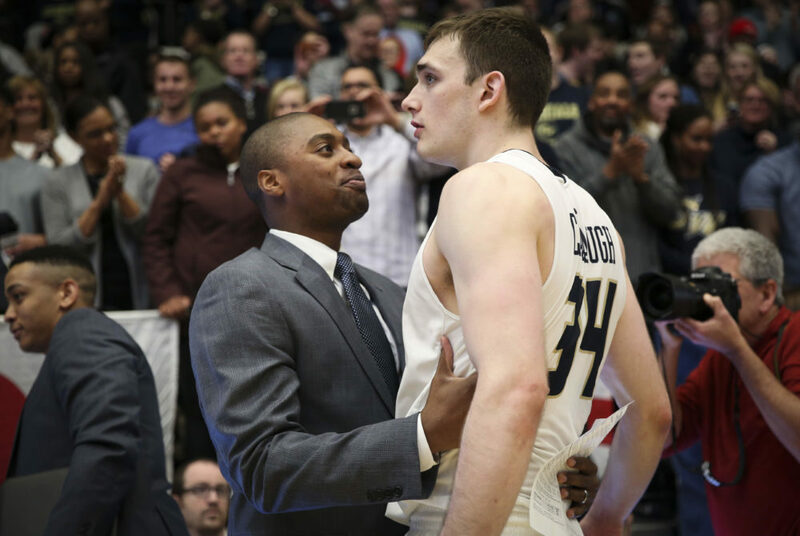 Interim head coach Maurice Joseph and graduate student forward Tyler Cavanaugh embrace after defeating Dayton 87–81 in their final regular season game of the year. Cavanaugh finished with a game-high 30 points and shot 6-of-8 from three-point range. 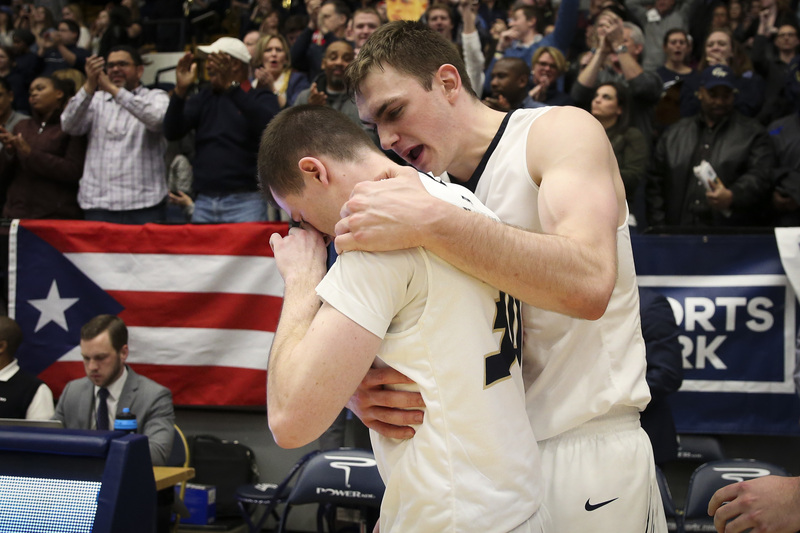 Tyler Cavanaugh said he couldn’t have written a better ending. The graduate student forward, along with redshirt senior guard Matt Hart, took the Smith Center floor for likely the final time Saturday night, and ended his collegiate career in Foggy Bottom with an exclamation point. With 6.0 seconds remaining, Cavanaugh received one last standing ovation from the home crowd after knocking down two free throws. He had just iced an 87-81 upset victory over the best team in the Atlantic 10. GW’s top scorer – who started all 31 games this season – finished with a game-high 30 points and eight rebounds against first-place Dayton (24-6, 15-3 A-10), tying a career-high six three-pointers in one the Colonials’ best shooting nights all year. The six-point decision over the Flyers pushed the Colonials’ winning streak to five games, and earned them a No. 6 seed in next week’s Atlantic 10 Championship. Redshirt senior guard Matt Hart scored 10 points and added two assists in likely his final game in the Smith Center as a Colonial. Cavanaugh and Hart were two of four Colonials to finish in double-figures. 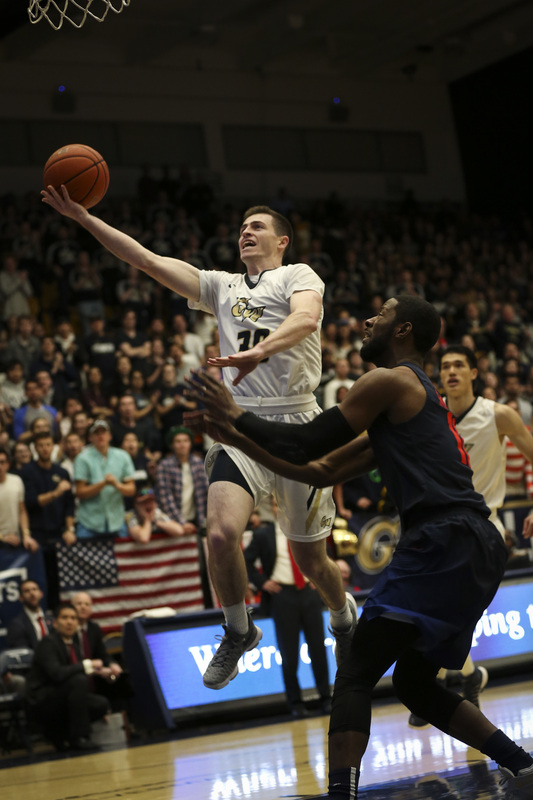 Junior guard Yuta Watanabe put up 18 points and freshman guard Jair Bolden notched 12, as the quartet accounted for all but one of GW’s fiery 13-of-26 clip from three-point range – tying a season-high. After honoring the fourth-year pair in a pregame ceremony, the Colonials (18-13, 10-8 A-10) went right to work. An electrifying 16-1 GW run opened the contest and set the tone for a hard-fought game in which the Colonials never trailed. Out of the gate it seemed as if GW couldn’t miss, going a perfect 9-for-9 from the floor and 3-for-3 from distance. A little less than midway through the first half, the Colonials had broken open a 27-8 lead – their largest advantage of the night – with hot shooting and an ability to force turnovers. Defensively, its 1-3-1 zone stymied much of Dayton’s first-half offense, which shot 48 percent and just 1-for-7 from beyond the arc in the frame. The Flyers responded with a few small runs, but GW was still able to take a commanding 50-33 edge into halftime. The Flyers – already a lock for the No. 1 seed in the A-10 ahead of Saturday’s game – came out of the locker room ready to play. The visitors opened the second half with four straight three-pointers on five possessions to close the gap and dampen some of GW’s momentum. The Colonials kept plugging away, however, getting strong contributions from Bolden, Cavanaugh and Watanabe to reach a 70-51 lead. But again Dayton responded, this time with an 11-0 run the cut their deficit down to only eight. Down the stretch, the Flyers made it as close as a two-possession game, but poised free throw shooting from the likes of Cavanaugh and redshirt junior point guard Jaren Sina kept them at bay. Cavanaugh comforts and emotional Hart after the game’s final whistle. In the game’s final minute, GW was up 80-74. Despite a few miscues in their own, the Colonials made a number of crucial stops to put the game away. The Flyers’ anemic 17-for-31 mark from the charity striped – to GW’s 20-for-28 – helped as well. Up 85-81, Cavanaugh fittingly scored the final two points of the night at the line to shut down Dayton for good. The Colonials now await the winner of No. 11 Saint Louis and No. 14 Duquesne in the second round of the A-10 Tournament in Pittsburgh, Pa. Tip-off for that game is scheduled for Thursday at 8:30 p.m.